"If he dies, he dies." After Michael B. Jordan's wonderful take on Adonis Creed brought some fresh blood to the Rocky saga in Ryan Coogler's 2016 film, the theme of family is very prevalent in Steven Caple Jr.'s sequel, Creed II. As stated in our spoiler-free review, Apollo's son might be feeling like he's on top of the world, but there's a massive challenge lying in wait and we're emphasising the word massive. 6-foot-4 and close to 250 pounds, there's a reason why Florian Munteanu has earned the nickname 'Big Nasty' and in Creed II, the real-life boxer is an absolute machine hellbent on destruction and revenge. Of course, it also helps that the family of Munteanu's character, Viktor Drago, have an extremely complex history with Rocky Balboa. After Ivan Drago killed Apollo Creed in the ring during Rocky IV, 'The Italian Stallion' gained some retribution for the death of his friend after beating the formidable Russian in the ring. We can all remember Rocky famously stating: "If I can change, and you can change, then everybody can change!" Well, change has happened in the ring and after it was revealed that Sylvester Stallone has seemingly hung up his gloves, it's over to the new generation to keep trading those punches. 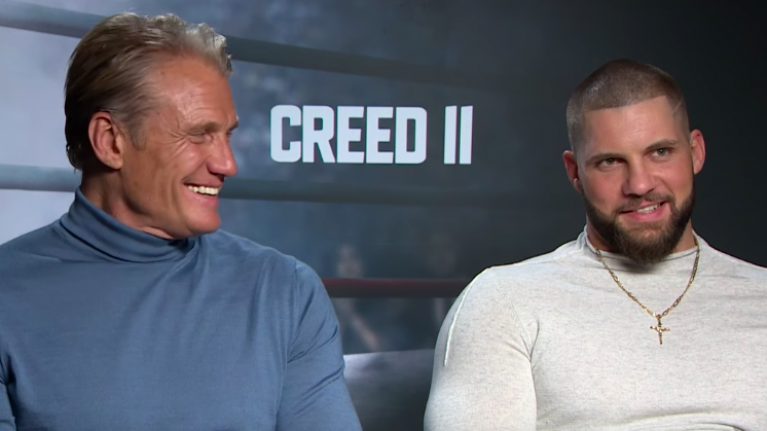 On this note, JOE's Rory Cashin caught up with Dolph Lundgren and Florian Munteanu to chat about Creed II this week. When asked about the possibility of a Drago spin-off, both men gave the other a knowing look as Lundgren pointed to his on-screen son. "Well, emm, let's say it like this, there are some ideas going on and we'll see. We'll see." As you can see, that smile from Lundgren is very telling! Aside from chatting with these two gentlemen, Rory also had the opportunity to chat with the film's director, Steven Caple Jr., and leading actress, Tessa Thompson.